This bonsai tree from our Premium Range has an artistically shaped, twisting trunk with textured bark in a variety of differing shades. 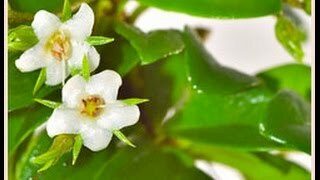 An ensemble of glossy green leaves are found at its top and tiny white flowers which contrast with them can be seen during its flowering season. Both its leaves and its flowers have unique shape, giving the bonsai tree a stunning and very well proportioned design. Alongside your bonsai will come the sea-blue ceramic pot and matching drip tray and a full set of care instructions. An oriental tea tree, or Carmona microphylla is symbolic of courage and ‘heart’. Care instructions included and personalised gift wrap available at checkout. This is a charming bonsai, which displays dainty white flowers during summer months. The first bonsai grown by the Chinese hundreds of years ago were scenes like this designed to be artistic replicas of small oriental landscapes. Very beautiful in a classic glossy sea-blue pot and matching drip tray. * Pot details: Classic Glossy sea-blue ceramic bonsai pot.